The market for Flash-based Solid State Drives has matured significantly over the course of the last years, as new technologies have enabled increased performance and capacity as well as better pricing policies and reliability, when compared to some of the initial models. SSDs are becoming more and more an alternative for computer users looking to boost their system's performance, taking advantage of the read and write specifications of these compact and energy-efficient storage solutions. On that note, there are a number of SSD products out there and more to come along the way, providing users with new alternatives for boosting their system's performance. Such is the case with one of Kingston's latest products, a new SSD that has just been launched as part of the company's SSDNow V series, specifically designed for mainstream users looking for a way to improve boot times and application startup. Featuring a capacity of only 40GB, the new SSD from Kingston is said to have been designed as a choice for desktop PC users looking for a high-performance drive that can be used for installing the operating system and some of the most accessed applications. Kingston, as you might already know, is one of the most recognizable brands in the market for Flash-based storage solutions and a leading provider of memory solutions. The company debuted on the growing market for Solid State Drives with the adoption of a co-branded series of Intel SSDs. Having learned from that experience and looking to further expand its presence in the market, the company later announced the debut of its own series of SSDs, with the launch of the new V-series. The model that we will be testing today has been specifically designed to host just 40GB of capacity, making for an ideal choice for a desktop computer's first partition. The performance specifications of this storage solution clearly indicate that it hasn't been designed to replace a PC's hard drive, but rather the OS partition, enabling users to increase their system's overall performance with faster boot times and speedier applications. Now, without further ado, we shall proceed to the technical part of our review, providing you with more detailed specifications on what this SSD has to offer. We will go through the manufacturer's specifications and claimed performance stats, compare them with our results and then try to draw a conclusion on what this new SSDNow V solution has to offer. Sequential Speed: up to 170MB/sec. The Kingston SSDNow V 40GB Solid State Drive is the second such solution from the company we were presented with the chance to benchmark and put through its paces. However, this is truly our first review of a Kingston-made SSD, which is why we were interested to see what the manufacturer has managed to achieve without the help of the Santa Clara, California-based chip maker, the world's leading vendor of high-performance processors, Intel. Before we head on and talk about the testing platform and the applications we used to benchmark the performance of Kingston's new SSD, we do have to mention a couple of things. As you'll see on the cover of the SSD, this product is clearly intended for use as a desktop storage solution, more specifically, as a replacement for the system's OS partition. The 40GB SSD is accompanied by a desktop upgrade kit and looks to provide consumers with faster boot times and increased application responsiveness. Although you can use it in some of those high-end notebook PCs, with dual storage drives, Kingston clearly indicates this product as a solution for desktop PC users, who can take advantage of the system's other HDDs for storing less important applications and other digital content. The platform, for the various benchmarks we went through with the new SSDNow V drive, was a Dell Optiplex 740 desktop PC, featuring an NVIDIA GeForce 6150 chipset, coupled with an nForce 410/430 MCP and an AMD Athlon 64 X2 4200+ processor, running at 2.2GHz and coupled with 1,5GB of DDR2 memory and an 80GB Western Digital, 7200RPM 3.5-inch hard drive. As Microsoft's much-anticipated Windows 7 operating system has just received its official market debut, we wanted to see how the new SSD took advantage of the optimizations enabled by Microsoft's much-anticipated OS. With that in mind, we proceeded to testing the drive's performance using some of the most popular benchmark applications, currently available. We used the HDD Test Suite in PCMark Vantage, HD Tune, the suite of HDD tests available in Lavaly's Everest application, as well as the increasingly popular ATTO Disk Benchmark. The SSDNow V 40GB drive from Kingston is essentially a 2.5-inch SATA-enabled storage solution that has been specifically designed for use in today's mainstream and high-end computer systems. It comes with a rather useful bundle, which includes a desktop upgrade kit, namely the necessary 3.5-inch brackets and mounting screws and the SATA power and data cables. That, alongside the small SSD, will enable users to install the drive inside their desktop PC, much in the same way as any other traditional 3.5-inch hard drive. The bundle includes everything you need to set up the drive inside your desktop PC chassis. With a regular Phillips screwdriver you will easily mount the provided 3.5-inch brackets on the back side of the SSD, while the additional mounting screws will enable you to install the drive inside the 3.5-inch internal bay. The SATA power and data cable sure come in handy, especially for those users that have to make do with the cables that are available in the chassis and which are usually taken by the available hardware. As it is featured with a traditional SATA interface, the drive will immediately be recognized by the operating system and the system's BIOS. Initializing the drive is as easy as on any other traditional hard drive, so theoretically you shouldn't have any issues with the installation process of the new part. Talking about performance, as you can see in the screenshots below, the drive is capable of delivering the promised read and write speeds, so you'll pretty much get what you paid for. In HD Tune, it managed to deliver an average read speed of 197.4MB/s. Things were pretty good in the ATTO Disk benchmark as well, while in PC Mark Vantage's HDD Test Suite, the low-capacity SSD managed to score an impressive 30271 points. We wanted to test the boot times and the drive's performance when dealing with some of the most widely used applications, but we had little time to do a fresh install of Microsoft's brand-new Windows 7 operating system. We will, however, update the article as soon as we have the stats, once we will have the performance details. One more thing that we liked about the new SSDNow 40GB storage solution was that Kingston will provide users with a rather useful bundle, which includes the aforementioned 3.5-inch brackets and mounting screws and the SATA power and data cables, but also a rather useful hard drive cloning software, available on the installation CD. Kingston's SSDNow V 40GB does provide an interesting choice for consumers, which are being prompted to consider it as a solution for their desktop PC, more specifically as a replacement for their main OS partition. While there are many low-capacity or low-priced storage solutions already available on the market, the performance specifications and speed of the new Kingston SSD do make it a noteworthy alternative. Performance is everything you'd expect it to be, that is if you don't plan on using the drive as the main storage solution for a small, portable computer system The bundle is what you should go for with the drive, as the price difference isn't that significant to give up on the aforementioned software and tools. We haven't talked much about the pricing of the new drive, but this is basically where we've got our mixed feelings. It will go on sale for an MSRP of US$123 with the included bundle, while the standalone offering is US$117. That said, the Kingston SSDNow V-series 64GB MLC-based SSD with desktop bundle is currently available at Newegg for US$158.99 and will provide you with increased storage capacity but with a lower read speed of 100MB/s and write speed of 80MB/s. The bundle is pretty much the same for both drives, but the 64GB model appears to provide a better alternative. It's up to you to choose between a higher-capacity SSD for approximately US$30 more and a 40GB model that offers an impressive read speed, optimized to become your new OS partition. The choice would be easier if the price tag for the 40GB went a bit lower, somewhere in the US$100 range. Kingston's new SSD does look to provide computer enthusiasts with a rather interesting choice when looking for a desktop storage solution. The drive's overall performance is impressive, but it's certainly not a choice for those looking to expand their system's storage capacity with a faster drive. Pricing isn't really that bad, but with the 64GB costing nearly as much as the 40GB model, the choice is rather difficult. Nokia's XpressMusic series adds another device to its portfolio, Nokia 5730 XpressMusic, a smartphone that combines business and multimedia features. While the phone may look like an ordinary bar handset, the surprise comes from the fact that it comes with a full QWERTY keyboard. More goodies included are two game-dedicated keys placed above the display. Nokia 5730 XpressMusic is a mid-budget device stuffed with lots of features that will surely meet any user's demands. Either it's music that you wanna listen or games that you wish to play, Nokia 5730 has it all and even more. Other highlights of the smartphone include Wi-Fi, GPS receiver, N-Gage support, 3.5mm audio jack port, 3.2 Megapixel camera, FM radio with RDS support and many more. Nokia 5730 XpressMusic was announced in March 2009 and was available on the market starting June 2009. The device can be acquired in any of the available colors – Red, Monochrome, Blue or Pink – for a very good price, of only $340 USD. Nokia 5730 XpressMusic doesn't stand out from the crowd through its design, as it rather looks cheap, since the manufacturer chose a cheap plastic, which is common to mid-budget handsets. You might think that this hurts the phone's design, but in the end it's the user who decides if he or she likes it or not. The candybar form is also specific to XpressMusic series, but this is somewhat contradicted by the full QWERTY keyboard attached, which can transform the handset into an authentic slider. The rounded shape of the phone gives him some ergonomic value, but this is where it stops. Nokia 5730 XpressMusic measures 112 x 51 x 15.4 mm and weighs 135g (including battery). The front plastic used for manufacture is shiny and very well polished, while the one on the back is rather mat. This means that the front part of the handset will be covered with fingerprints and grease as soon as you start using it. There's no solution to this, so you will just have to live with it. Anyway, the handset features a 2.4-inch TFT display, which is not protected in any way. Just above the screen there's a secondary videocall camera, which can also be used to take snapshots. Opposite to the secondary camera there's a small ambient light sensor, while in between there are two controllers used for N-Gage games. The small keypad below the display is easy to text with, except for the contextual keys, which are difficult to use. The specific Symbian and the C (Delete) keys are very small and very hard to press. The same goes for the two soft keys, which are also somewhat hard to work with. The big D-pad button can also be used as Enter key to control the various menus of the phone. The full QWERTY keyboard can be used when the phone is slid. It features 39 very flat keys with a very good backlighting. The first row near the sliding mechanism is a little bit harder to access if you have bigger thumbs, but that isn't such a big disadvantage. The keyboard is very nice to the touch and the keys are responsive, but its flatness makes the texting experience somewhat weird. On top of the slider there's a 3.5mm audio jack, while on the bottom there's a small charger port. The right side of the handset features a dual-volume key and a dedicated camera key. The left side features a small microSD slot card and a microUSB port, both covered by a plastic stripe. One of the main traits of the handset, which defines it as belonging to the XpressMusic series, is the 3-dedicated music keys, which have been placed along the left side of the display. These are meant to control the music player without the need of browsing deep into the phone's menu. The back side of the phone includes a 3.2 Megapixel camera with flash and autofocus. There's no protection for the camera module, so scratches are possible. All in all, Nokia 5730 XpressMusic is a mid-budget device that can be very easily used as a candybar or slider, if need be. Nokia 5730 features a 2.4-inch TFT display, supporting 16 Million colors and 240x320 pixel resolution. Besides its medium size, the screen is pretty good, in accordance with Nokia's standards. It's readable in the sunlight and features good brightness and nice colors, but it is not protected against scratches in any way. For more in-depth info regarding performance, check out the benchmarks below. The 3.2 Megapixel camera features LED flash, auto-focus capabilities and Carl Zeiss optics. Unfortunately, the camera module lacks any protection, so scratches might appear after one month of use, but hopefully this won't drag down the picture quality. The maximum resolution that users can set to take pictures is that of 2048x1536 pixels. Movies can be recorded in VGA resolution at 30fps, while clips can be saved in MPEG4 file format. The interface is pretty much straightforward and limited in choices, with settings like Scene modes, Sequence mode, Color tones, and White balance. An interesting fact is the possibility to customize the Settings bar on the right with shortcuts that will give you quick access to various settings of the camera. As you can see from the samples, the camera is decent and takes good pictures. Not bad, but not very good either. I think decent is the word that can define pictures taken with 5730's camera. There is little noise in taking the snapshots, contrast is very good, and color rendering is accurate enough thanks to the processing software of the camera. 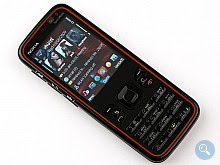 Nokia 5730 runs Symbian 9.3 operating system, with S60 3rd Edition and Feature Pack 2 interface. Besides the usual improvements added by FP1, you'll now be able to add your favorite contacts on the new Contacts bar that appears on top of the screen. Each contact is represented by a small avatar (thumbnail) chosen from the Gallery or by taking a picture with the camera. Clicking on any of the contacts added will bring up a list with various options that will enable you to edit the contact, send a message, call or add feed. The last one means that you'll be able to add feeds instead of contacts, so you can quick access it from the Homescreen. The screen is more populated with a bar that usually shows your emails, as soon as you set up your mail account. The last row of shortcuts contains by default: Music player, N-Gage, Message, Gallery, Web browser and Facebook. These shortcuts are fully customizable, as more others can be added instead of the default ones. Another new feature that has been introduced by FP2 is the availability of animation when browsing the menus. The Search utility has been improved with a new function called 'Say and Play.' Basically, you can pronounce any artist or song name by using the built-in speaker, and the phone will start playing the correct file, if the respective word is included in the song's metadata. The device only recognizes English language or English pronunciation, in case you thought of other language names. Nice features, but they didn't work too well. Furthermore, you have quick access to the task manager, as the function appears now at the top of every pop-up menu. The phone also supports the latest version of Adobe's Flash Lite 1.5, the interoperable platform that enables the accelerated development and delivery of rich graphical mobile content, and includes audio file playback and streaming capabilities that provide audio and music enhancements to both mobile gaming and multimedia experience. The handset also includes some useful applications, such as Search, Alarm clock, Calendar, To-do list, Notes, Calculator, Countdown timer, World Clock, and Stopwatch. The menu is fully customizable and you can designate any MP3, MIDI or AAC file as ringtone. Moreover, Nokia's integrated browser has not changed, but it offers a great Web navigation experience. There's also a payment application called 'we:offset' and the usual AcuWeather. The phonebook can store an unlimited number of contacts, as long as you have enough storage memory left. The fonts can be customized, though only those displayed when opening Contacts, Web browser and messaging sections. If you are looking for games, Nokia 5730 XpressMusic doesn't contain any, but you can download some trial games by using the N-Gage platform integrated. The phone is compatible with Java MIDP 2.1 applications, but also with any Symbian S60 3rd Edition software. Nokia 5730 XpressMusic is a quad-band GSM (850 / 900 / 1800 / 1900) handset, HSDPA (3.6 Mbps) compatible, which features GPRS class 32 (100 kbps), EDGE 32 class (296 kbps), High-Speed Circuit-Switched Data (57.6 kbps) and Wi-Fi 802.11 b/g, UPnP technology. Tested on the EDGE and 3G networks, the handset performed a little bit above average, as you can also see in the screenshots. When connecting the USB cable, you'll be able to choose among five modes: PC Suite, Mass storage, Media transfer, Image transfer and Connect PC to web. All five of them are intuitive and easy to use, so there's nothing more to add here. The process of synching is very fast, browsing and transfers are made very quickly between phone and PC. Other connectivity tools include Bluetooth 2.0 with A2DP and EDR support, and microUSB 2.0 for PC synchronization (charging). The Bluetooth connection reaches easily almost 135 KB/s, so you'll be able to transfer data fast. The built-in GPS receiver supports A-GPS function and works flawlessly together with the newly renamed Ovi Maps. In terms of messaging, the phone offers standard SMS and MMS messaging solutions, accepting all available message types. The device also includes an audio message editor and e-mail support. The message client works with POP3, SMTP, and IMAP4 protocols, and supports more than one e-mail account. Additionally, it can download headers and supports attachments. Nokia 5730 is powered by a single ARM11 family processor running at speeds of up to 369 Mhz. Compared to the latest Nokia handsets, which include more powerful CPUs (600 Mhz), 5730 might seem a little bit undergeared. Still, it acts smoothly while browsing menus, even when the music player is started. But don't try to open more than 2 applications as the device is not really meant for such a high level of multitasking. The handset embeds 100 MB user free internal storage memory, 128 MB SDRAM memory. Bear in mind that just 85 MB are free executable RAM memory. Anyway, storage space can be expanded up to 16GB through the hot-swappable microSD slot card. The sales package also contains an 8GB microSD card. Instead of being a complete multimedia solution for those looking for the perfect music phone, Nokia 5730 XpressMusic only offers a glimpse of how such a phone might be. The product comes with new wired stereo headset (HS-83) and remote control plug AD-54 with music controls, but better headphones can be added thanks to the 3.5mm audio jack. The music player interface looks exactly like in previous XpressMusic series music players and supports an impressive number of file types (including MP3, WMA and eAAC+). Without impressing too much through its sound quality, Nokia 5730 could be a decent choice for those looking for a music phone with high-battery autonomy. The music player features an Equalizer that includes a Bass-booster setting, Stereo widening, Loudness and Balance. The FM radio has a standard interface, and can automatically scan and save the available stations. It features RDS support and Visual radio. The Visual radio application can download all the local stations and save them to the handset with their names. Both functions, radio and music player, respectively, can be run in the background with no problems. Nokia 5730 also includes Real player for playing video clips. The video player can be displayed in both normal and fullscreen modes. Unfortunately, the medium sized screen makes the whole experience rather frustrating. The 1000 mAh Li-Ion (BL-4U) battery has an officially stated life expectancy of 300 hours in standby (270 hours for 3G) and of about 5 hours in talk time mode (4 hours for 3G). Also, Nokia states a music autonomy of almost 1 day (25 hours). While I wasn't able to achieve the 5-hour talk time promised, our test unit made it for about 3 days with medium use. This is a decent autonomy, a little bit better than other XpressMusic handsets and this is probably thanks to the bigger capacity battery. 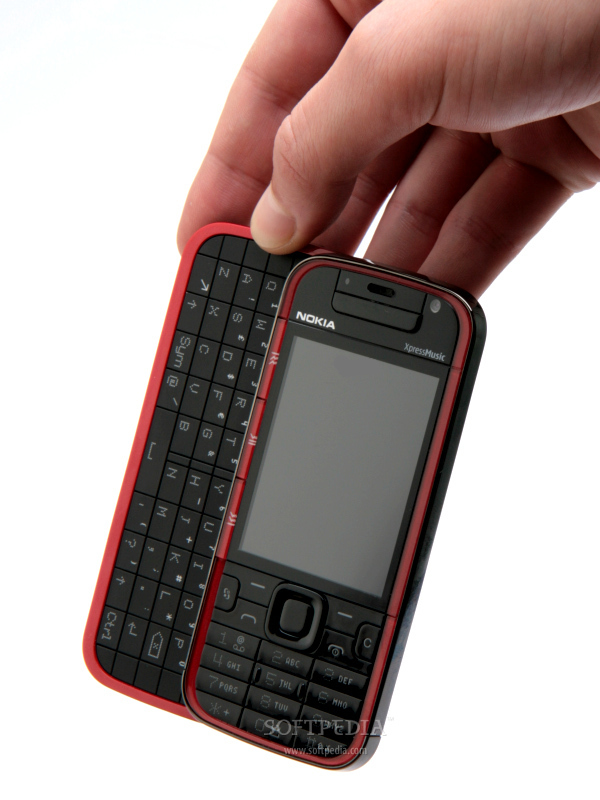 Nokia 5730 XpressMusic looks like an ordinary bar handset, until you discover its QWERTY keyboard. I would say that the phone might be a good choice for those youngsters who use their phones to text and listen to music a lot. A little bit sensible to the environment because of the cheap plastic, Nokia 5730 requires some level of protection from the user. The slider is a very good solution for music phone fans, especially since it features goodies like Wi-Fi, GPS receiver and QWERTY keyboard. Nokia 5730 is good value for money and boasts a wide range of features, which makes it such a versatile device. A good music quality sound as well as a decent camera are also some of the qualities of the handset. Perhaps the 'ordinary' construction of the phone is what hurts it the most, as the technical features are up to the standards. Also I didn't like the cheap feeling of the plastic that was used to manufacture the 5730 handset. Otherwise, the device is a simple mid-ranged phone, but with lots of features. Now that we’ve had some time to spend with the XPERIA X1, we’re going to break down the various features and give you our in-depth review. We’ll continue to update this post as we use the device more, but it doesn’t take a rocket scientist to understand what’s at hand — a brand new Sony Ericsson XPERIA X1! Full review is after the jump. Pictures will be added shortly. With a 800×480 VGA screen, you can’t really go wrong right? Right. We’ve got to say off the top that this is the best-looking screen we’ve ever seen on a Windows Mobile device. It puts all the others to shame. It’s not just that the screen has an amazing resolution, it’s that the screen is vibrant and clear as day. If your vision isn’t top notch you might have to increase the font size in settings because it gets a little small with that super high-res. Sunlight couldn’t phase it either as we had no problem using it on the go outside. We didn’t put the speakers through our normal tests just yet to be honest. We tried a couple MP3s and they sounded good, not great. The speaker volume in general could have been a little louder and the sound could have sounded a little fuller. Speakerphone was the same. We’ll report back with more detailed findings. If you’ve seen the Sidekick LX, you’ll know what we’re talking about. There are 4 independant notification lights on the four corners of the X1. These are LED lights that change through various colors. Unlike the Sidekick, you have complete control over the notification settings. Only want people to think you’ve got a UFO in your pocket when you’re getting a text message? No problem. There’s a lot to choose from to suit your own needs. The lights offer a nice touch and weren’t too over-powering and bright which we were afraid of. The kids will love it. Calls came in and out with crystal clear quality. The ear speaker was plently loud and the party on the other end said we sounded like we were on a land line. Name something you’d like to see in a mobile device… HSDPA? Wi-Fi? GPS? The X1 has all of it. T-Mobile USA lovers will also be overjoyed at the fact that an AWS 1700MHz version is coming. Our unit had the 850MHz/1900MHz US 3G bands so we were rockin’ over HSDPA just fine. In fact, web browsing was abnormally fast. We didn’t find much of a difference between browsing over Wi-Fi or HSDPA. That’s probably due to the bottleneck of the phone in general, but it was a pleasant surprise. Another winner for Sony Ericsson. While the device isn’t the lightest phone on the market, we think it’s build quality is almost second-to-none. Maybe even iPhone status. It’s just so sturdy and well put together. We have to give HTC some mad props on this one. Could you please try and incorporate some of this newfound metal addition into some of your devices HTC? Please. The sliding mechanism was fantastic even though the device isn’t a normal “flat” slider. Major points for build quality. This could be subjective depending on your view of Windows Mobile, but we found the X1 to be on par or better than any Windows Mobile device we’ve used. Baring the keyboard issue, (see below) there wasn’t anything that hindered us from taking full advantage of the device. When closed, the device gives you access to all necessary shortcuts on the bottom front of the unit. Slide it open and you’ve got access to everything you could want. People have wrote us and asked about how it is to use the phone when the QWERTY keyboard doesn’t have directional keys, but they’ve overlooked something — the optical joystick. This works wonderfully well and doesn’t have a learning curve. It’s a natural extension of what we’ve been forced to use in the past. There was a “cursor” menu in settings but no cursor showed up on the screen. You also have full control over the sensitivity of the optical joystick. Making phone calls was comfortable and we didn’t have any issues with people hearing us or us hearing them. The keyboard is a sensitive area for many people. Anyone who follows us know we take it very seriously — we put them all through the ringer! So, it pains us to report, that at least with our particular unit, the keyboard wasn’t great. It didn’t take time to get used to it, it just didnt perform like the way we had hoped. The reason is because the keys almost are completely flush with the case and don’t give good tactile feedback when pressed. Odly enough, the spacebar was actually ok. It faired the best out of all of them. We understand why there really is no travel in the keys — there is a huge sliding mechanism right over them — but we would have liked to see a little more feedback when typing. They have this triangular pattern on top which does make it easy to feel them, but you don’t get a good response when actually pressing them down. The backlight on the QWERTY ‘board successfully helped us find the keys when it was nightime, but that still didn’t help when typing. We said this before, but if we had to compare the keyboard to anything, it would be Sony’s UX-series computers. It’s the same exact thing. As we mentioned at the beginning, the Nokia 5630 XpressMusic is a smart phone powered by Symbian S60 3rd Edition with Feature Pack 2. We can think of at least a dozen other phones running the same operating system, but it’s the first time we have seen a new home screen, aside from the standard vertical and horizontal icon rows. It’s called “contact bar” and looks quite similar to the one on the Nokia 5800 XpressMusic that runs Symbian S60 5th Edition. As its name suggests, up to 20 contacts can be visualized on the screen and appear there with their assigned pictures. Selecting any turns call history and any messages you may have exchanged on screen. The same function is used to follow RSS broadcasts. Say, you create an entry, name it phoneArena then you can assign it a web-feed so as to see news updates right away. There is an info field below the contacts that, by default, notifies you of new emails. A shortcut to the Ovi chat service that you can, logically, get on through your Ovi account is to be found right below. You can replace the latter with a Wi-Fi scanner or a function that shows timeslots of your daily schedule, provided you have filled in your Calendar. Unfortunately, all three cannot be visualized at the same time. There is the option to place a row of icons at the bottom to gain quick access to audio player, radio, internet browser, Internet searches, N-Gage web portal and phone gallery. As you can see, most of the apps on the home screen are to do with the Internet. This is pretty normal, given the Nokia 5630 XpressMusic is much more than a music device. A quick look at the menus should be enough to convince you this is a device that can be easily used on social networks plus you will be able to feast your eyes on the new, pleasing icons, much in character of the Nokia 5800 XpressMusic. Shortcuts to Facebook, MySpace and Hi5 in the phone are located in the internet menu along with options to share files through YouTube and Ovi Share. You can connect to the Web via 3G (HSDPA 10.2Mbit/s) or Wi-Fi. The Symbian browser is really good and opens even heavy pages without any issues but it cannot play general Flash content, despite the fact YouTube videos are supported. If you can’t find anything amusing enough on the Internet, you can always chance your luck on the N-Gage portal. Games are purchased and downloaded from there and you can share your best scores with other players.